Here in the northern hemisphere, high school graduates are getting ready to head out to their first semester at colleges and universities across the US. While it is exciting, it can be a challenge, too. 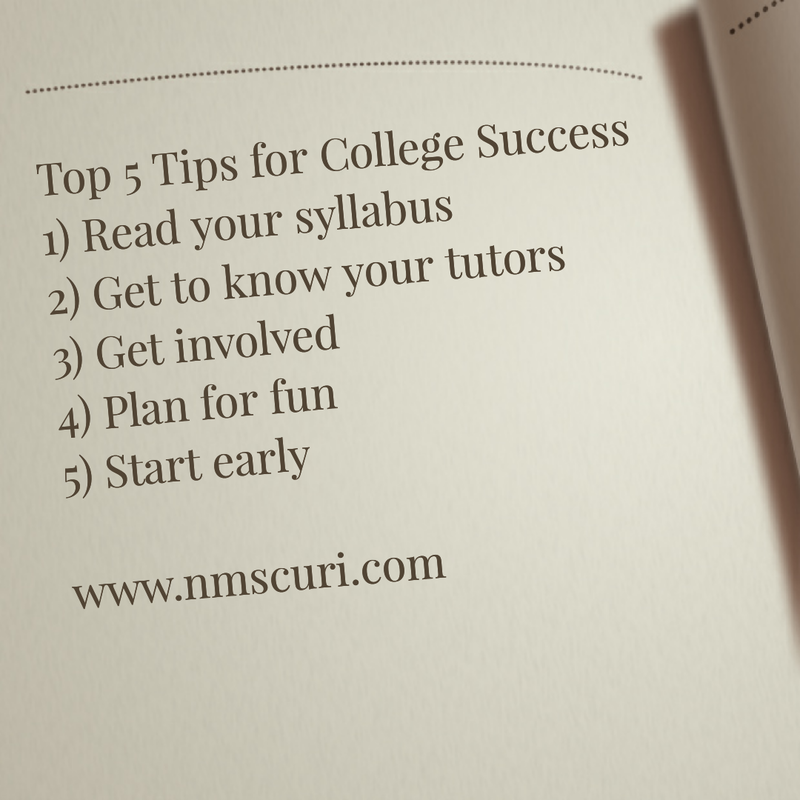 Here are a few tips that can make the transition from high school to college student that much easier. Read Your Syllabus. On the first day of class, your professor will hand you a syllabus or course outline. This contains a lot of very important information: The name of the instructor, contact information, what the class will cover, as well as due dates and other information about assignments. It does you more good if you read the paper and hang on to it, as opposed to tossing it in the back of your car. Few things annoy an instructor more than having a student ask a question that was already explained in the class outline. Get to Know Your Tutors. Most schools have some sort of tutoring and/or writing center. It's paid for out of your tuition, so they generally are free to students. Do yourself a favor and find what's available sooner rather than later in the semester. 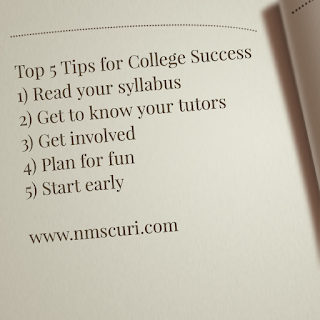 A good thing to do during the first few weeks of school is to take all your course outlines and bring them to a tutor. He/she can review your assignments with you, help you set up a plan to get everything done on time, and can usually set up appointments, so you can bring your work in for feedback. Some people won't go to the tutor because they feel it's a sign of weakness. Nothing can be further from the truth. Even if you did well in your high school classes, college work can be very different, with much higher expectations. The tutoring center tends to get busy at midterms, and by the time finals come around, it's almost impossible to get help, so the sooner you get in, the better. Get Involved. It's easy to get bogged down in the cycle of responsibilities, especially if you've never been away from home before, work in addition to going to school, or have family members to care for. What people forget is that school isn't just about assignments and going to class. It's about trying new things, meeting people, and getting out of your comfort zone. A good way of doing this is by attending events on campus and joining clubs. Studies have shown that students who get involved in school outside of the classroom are more likely to graduate on time and with a higher GPA. Plan for Fun. Sometimes you need to just get out and do stuff. Relaxation is important, especially if you're under academic pressure. The problem is that you need to get away whether or not you plan for it. If you don't allow time in your schedule for some fun, and you do decide to take time off, it's easy to get behind in your responsibilities, creating more stress. One solution is to make time in your schedule for an afternoon off, a social event, or whatever else you want to do. If it's on your schedule, you can work around it. Start Early. When I teach my Freshman Seminar class, on the last day of the semester, I always ask the students what they would tell themselves if they could go back in time to the first day of school. Nine times out of ten, they tell me "I wish I would have started my papers sooner." It's an easy trap to fall in to: It's August, you read the course outline, and the paper isn't due until December. That's because it will probably take you that long to get everything together to do the project, especially if you have to work with a group. By starting sooner, you can ask your professor questions (they are generally more cooperative if you ask a month before the due date as opposed to the night before), you can meet up with that tutor, and if you get stuck, it won't necessarily be a disaster for your grade. Besides, how would you rather spend your Thanksgiving, relaxing or hunched over your laptop all weekend? The choice is yours. Take Care of Yourself. I threw this in as a bonus. School, and all that comes with it, can be very stressful. You need to pay attention tot he basics: Get enough sleep, eat properly, drink water. Most schools have gym equipment for student use. If you're not feeling well, see the folks at the medical department. More importantly, if you feel like you are under a mental strain that is affecting you, please seek out help. People care about you.